This is a thoughtful and highly informative look at how yoga can be a very powerful tool to combat depression. Yoga teaches us how to lift ourselves out of depression and move toward a deeper sense of self. Find out how—and try these poses, breathing exercises, and mantras. Anyone who has suffered from depression understands how deep, abiding sadness or worthlessness can infiltrate and affect every aspect of our being. Our psychological makeup, physical health, mental outlook, and even our ability to interact with friends and family and be present to the world around us can get shaken to their core. Why? Because we identify with and attach ourselves to things that will inevitably change. As our feelings and other symptoms of depression persist, we have an increasingly difficult time imagining a life in which we break free from their spell and avoid “becoming” them. Yoga teaches us that we aren’t our feelings or our symptoms but live in multidimensional relationship with them. One way to grasp this paradox is to picture the Self (purusha or pure, undifferentiated awareness) as pervading all nine interlocking and interdependent spheres of influence without being any one of them. The first three spheres correspond to our moods, thoughts, and behaviors and, where they overlap, our sense of self or svabhava. These spheres profoundly affect—and are affected by—our memory, unconscious conditioning, and by the fourth sphere, our physiology, particularly our autonomic nervous system (ANS). The remaining five spheres represent our anatomy and our relationships with family, society, the world, and the entire cosmos. 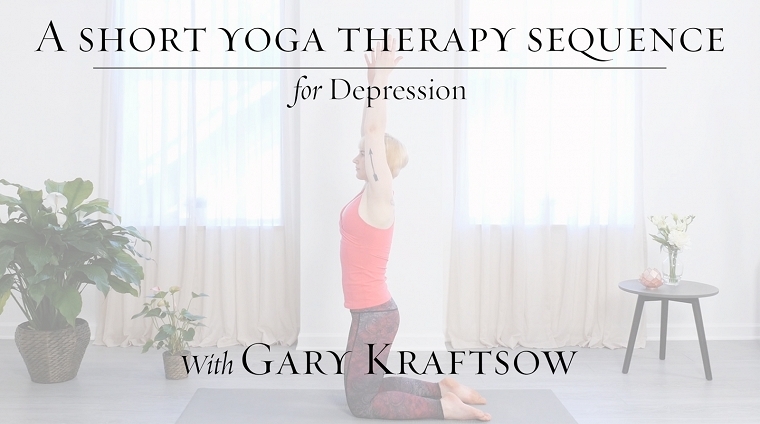 Depression tends to hit us on every level of our being, often all at once, which makes yoga the perfect antidote for the physical ramifications, mood swings, thoughts, and behaviors that it engenders. From a physiological perspective, depression affects the entire body, including the digestive, respiratory, hormonal, and cardiovascular systems. Yoga therapy’s main impact on our physiology is via the sympathetic and parasympathetic functions of the ANS. Depression creates a state of sympathetic/parasympathetic disregulation, which further impacts how we feel, what we think about, and how we behave. The sympathetic nervous system governs the functions involved in the fight-flight-or-freeze response and is activated when we perceive danger. The parasympathetic nervous system governs the functions involved in the rest-and-digest or rest-and-repose response and is activated when we are at rest. Although some types of depression include sympathetic activation (feelings of agitation or anxiety), when people become depressed, they most often experience a state of sympathetic suppression. They may have physiological symptoms such as fatigue, lethargy, sleep disturbances, gastrointestinal distress, and/or decreased libido or sense of pleasure. Practicing asanas with adapted breathing, pranayama techniques, and guided relaxation will help to balance the nervous system. For example, doing standing postures and backbends with an emphasis on movement—during which you progressively lengthen the inhalation and the exhalation and gently hold the breath at the end of the inhalation—will activate the sympathetic response and energize the system. The way you respond emotionally to what happens around you and within you is influenced by conscious memories and unconscious conditioning, as well as by your thoughts, behavior, and physiology. When you become depressed, it’s not unusual to feel sadness, grief, despair, emptiness, helplessness, hopelessness, or shame. The ancients used meditation, chanting, mantra japa, prayer, right relationship, and right association to elevate mood. Mantra japa—one of the most powerful yogic tools for this level, along with pranayama—emphasizes both the meaning of the mantras (artha) and the feelings or attitudes they engender (bhava). Traditionally a teacher who knows you well would choose a particular mantra for you to work with. If you don’t have a teacher, you can begin by choosing a mantra or a symbol that takes you beyond your thought distortions, uplifts your mood, connects you to sources of inspiration and positive feelings, and moves you away from loneliness or isolation. The company you keep, the activities you participate in, and the values you hold also profoundly impact your mood. Thus, practices for this sphere include cultivating right associations—what yogis call sangha or satsangha—and right relationships, which can steer you toward people and things that are more meaningful, uplifting, and positive, and nurture feelings of love and joy, tolerance, compassion, and generosity of spirit. When you feel down, your mind can wreak havoc on your moods and behavior, as well as on your physiology. Depression clouds your self-concept—the stories you tell about yourself, the way you interpret events that occur around you. Low self-esteem, guilt, regret, a sense of futility, apathy, and pessimism permeate your thoughts, and you get stuck in a self-destructive spiral. Developing the ability to sustain focused attention (one-pointedness) is necessary to bring your mind under control and to create mental stability. Once you can maintain one-pointed focus, use deeper forms of meditation such as vichara(inquiry), svadhyaya (self-reflection), and pratipaksa bhavanam (cognitive reframing) to develop discrimination and wisdom and to reawaken your intellect. You may also find inspiration or insight by studying sacred texts or turning to any piece of writing that inspires you, or through a renewed commitment to your faith. Through meditation and study it’s possible to regain a sense of meaning and purpose and find a broader perspective on life, which is essential to healing and freeing the mind. Being depressed can often radically alter the way you act toward yourself and others. So it’s not unusual to lose interest in daily activities (the behavior sphere)—and stop taking care of yourself physically or wall yourself off from friends and social obligations. Cultivating determination, strengthening the will, and setting and activating intention are the cornerstones of yoga practice and can help you overcome habits and dysfunctional behaviors that can paralyze you and keep you depressed. To get started, a yoga therapist may suggest specific practices (sadhana) that emphasize discipline, impulse control, and self-restraint. Such sadhana may include what yogis call tyaga or selective renunciation, abstaining from something you habitually do in order to become free of attachment. You can begin by giving up something you know isn’t good for you, like eating junk food, which should give you confidence that you can overcome your habits. But ultimately, practicing tyaga means selectively renouncing something you are attached to, even if it’s not bad for you—like foods you eat for entertainment rather than nourishment. This practice strengthens your will and intentions, making them stronger than your habits. Creating some form of daily ritual—a few minutes of breathing exercises or a morning walk in the neighborhood—as well as selfless service can further pull you out of a depressed state. Doing something, no matter how small, for yourself and/or for others, can generate and release positive energy and set you on the path toward wholeness. Each of these four spheres—mood, thoughts, behavior, and physiology—is profoundly affected and driven by our memories and our unconscious conditioning. Committing to personal practice helps us become free of the twisted journey of thoughts, feelings, desires, conflicts, distractions, and habitual and dysfunctional behavioral patterns that dissipate our energy and keep us locked in depression. How? By purifying memory and bringing the unconscious impressions and impulses that drive us to the level of the conscious mind. When we can see our patterns clearly, feel them, experience them as mutable and impermanent, we take the first step toward freeing ourselves from their influence. Purifying memory is the combined effect of all the work done in the four spheres through an integrated practice, one that encompasses much more than what we typically experience doing asana on our yoga mat. Such a practice includes everything we do to take care of ourselves—taking walks in nature, performing selfless service, connecting with friends, even going to work or cleaning the house. Purifying memory does not mean developing selective amnesia. It means we learn to see things as they are without reacting or misperceiving them. An integrated practice like the one that follows, in which breath, sound, meaning, and feeling are linked through asana, pranayama, meditation, and mantra japa can help you harness and direct all of your energy toward deep and lasting transformation at every level of your being. This sequence works on multiple levels using asana, pranayama, chanting, and mantra meditation. The asanas here have a breath focus rather than a form focus. This “breath-centric” practice enables you to directly impact your physiology—most particularly the autonomic nervous system (ANS)—balancing the sympathetic and parasympathetic responses. The inhalation in this practice emphasizes the expansion of the chest cavity and the rib cage. This method of inhalation, unlike the breathing that begins in the belly, more directly activates the sympathetic response, which builds energy and awakens the system—useful for anyone suffering from depression. Certain postures use antah kumbhaka, or breath retention, after the inhalation, which increases its energy-enhancing effect. When you practice retention, feel as if you’re still inhaling—rather than clamping down like a pressure cooker—and slightly extending the movement that happens on the inhalation. This practice also highlights the power of chanting and self-reflective meditation, both integral to traditional yoga and tantric traditions. The chant used, Om jyotir aham, means “I am the light of pure consciousness.” While specific breathing techniques in asana and pranayama directly impact physiology, both chanting and meditation have a strong, positive influence on your mood, your self-concept, and your behavior. Do the whole chant on one exhalation. In addition, pay attention to the relationship between the flow of the breath and the movement of your body. Although the primary emphasis is on breath and sound, the details of the posture are also important. When chanting out loud, relax and open your mouth fully. Think of your body as a hollow bamboo resonance chamber and allow the vibration of the mantra to permeate your entire being. As you move into meditation at the end of the practice, you’ll continue to feel that vibratory effect and its meaning infusing your whole body—that is where the true power of this practice resides. Meditation is a profound art that begins with mastering the field of attention through one-pointed focus, and then sustains that focus for an extended period of time. The practice here works with your mantra and its meaning. As you bring your attention increasingly to bear on that mantra, its meaning becomes more fully absorbed into your being, and you have the potential to radically transform your mood, and even your own self-concept. Purpose: To center the body, mind, and breath. How To: Lying on your back, position your feet slightly wider than your hips, arms extended at the sides, palms facing up. Allow your eyes to close, and come into a state of mindful present awareness. Notice your state of mind, your thoughts, feelings, and bodily sensations. Recognize where you are in time and space, lying on the floor in your home or in a yoga studio, in the town or city where you are. Expand outward and take in the country in which you find yourself; and then go deeper, conceiving of the planet Earth, and then Earth in a solar system, third planet from the sun. Picture the sun in the center of our solar system, radiating light. And beyond that, our solar system, which is in the tail end of a spiral galaxy called the Milky Way, at the center of which is inconceivable, brilliant, radiant light. Take a moment to return to where you actually are. Moving from a sense of the vastness of the galaxy back to the solar system, to planet Earth, to the country you are in right now, to the town or city, to the building and room you are in. Bring your attention back to your body. Feel the energy pulsating, the vibratory quality of aliveness in your body. Notice your feelings and thoughts. Come back to a state of mindful present awareness. Now bring your awareness to the tip of your nose and feel your breath as it moves in and out of your body. Progressively deepen your inhalation and lengthen your exhalation. As you inhale, feel the chest expand and the belly rise. As you exhale, feel the belly move back toward your spine. Purpose: To coordinate the arm and foot movements—asymmetrical and symmetrical—with the flow of breath. How To: Lying on your back, inhale fully and exhale completely, arms extended at the sides, palms down. On an inhalation, simultaneously raise your left arm and flex your right foot, extending the right heel. As you exhale, simultaneously lower your left arm and relax your right foot. Repeat with the right arm and the left foot. Progressively increase the count of the inhalation and the exhalation from four counts each to six counts. Do this variation two times on each side, alternating the arm and foot combinations. On an inhalation, raise both arms and flex both feet, extending through your heels. As you exhale, lower both arms and relax both feet. Breath Adaptation: Inhale and exhale to a count of six. Do this variation two times on each side, alternating sides. Reminder: Draw your chin in slightly so the back of the neck stays long (but not flattened). After the last repetition, rest for one or two rounds of breath. Purpose: To relax the neck and the upper and lower back, and to gently stretch the area between the belly and the thighs. How To: Lie on your back with your knees bent, feet comfortably close to and in line with the sit bones, arms extended at the sides, palms down. Inhale fully and exhale completely. On an inhalation, press through your feet and raise your pelvis up toward the ceiling, lifting the spine up vertebra by vertebra until the upper back is gently stretched and the neck is flattened into the floor. You should feel a stretch in your belly and the fronts of the thighs. On an exhalation, lower the spine one vertebra at a time until the pelvis reaches the floor. Practice this variation three times. On an inhalation, press through your feet and raise your pelvis up toward the ceiling, as you bring both arms up and overhead, resting the backs of the hands on the floor. On an exhalation, unwind the spine and lower the arms and the pelvis to the floor, palms down. Repeat three times. After the last repetition, rest for one or two rounds of breath. Purpose: To lengthen the spine and stretch the back and the backs of the legs. Details: Bend both knees into your chest, arms extended down at the sides, palms down. Inhale fully and exhale completely. On an inhalation, simultaneously raise your left arm up and back toward the floor and extend your right leg up toward the ceiling, keeping your left knee bent toward your chest. Flex your right foot, extending the heel. As you exhale, lower your left arm, bend the right knee into the chest, and relax the foot. Repeat with the right arm and the left foot. Progressively increase the length of the inhalation and exhalation from a count of four to five, two times each. Repeat four times on each side. On an inhalation, simultaneously raise both arms up and back toward the floor, lift both legs, and flex both feet, extending the heels. As you exhale, lower your arms, bend your knees into the chest, and relax the feet. Inhale and exhale to a count of six. Repeat two times. Keep your chin drawn down slightly so the back of the neck stays long. After the last repetition, release the soles of the feet to the floor and rest for one or two rounds of breath. Purpose: To stretch the back. How To: Come onto your hands and knees, with your knees directly beneath your hips and your hands directly beneath your shoulders. Inhale fully and exhale completely. Inhale as you expand your chest and lift it away from the belly, stretching the front of your torso and flattening your back. Lift your chin slightly. Exhale as you draw the belly in, rounding the lower back, bend the elbows, and take the chest and belly to the thighs, hips to the heels, and forehead to the floor. Purpose: To introduce chanting on the exhalation with the mantra, Om jyotir aham, which focuses on qualities of light, such as radiance, illumination, clarity, and brilliance. How To: Begin by sitting on your heels, and then stand up on your knees. Inhale fully and exhale completely. On an inhalation, lift your arms forward and overhead, and chant “Om” mentally. As you exhale, chant “Om” out loud and bend forward, sweeping your arms behind your back, palms up, hands to sacrum, chest and belly to thighs, and forehead to the floor. Inhale again, while chanting “Om” mentally, and sweep your arms wide, coming to standing on your knees, arms reaching overhead. Exhale as you chant “Om” out loud and bend forward, sweeping your arms behind the back, palms up, hands to sacrum, chest and belly to thighs, and forehead to the floor. Repeat the sequence six times. After the last repetition, stay in child’s pose for a round or two of breath and then sit back on your heels and rest. Purpose: To further activate the sympathetic nervous system by introducing larger movements in a standing position, retention of the breath after the inhalation, and coordination of movement on the exhalation with chanting. How To: Stand up and place your feet hip-distance apart. Inhale fully and exhale completely. On the next inhalation, raise your arms out to the sides and overhead, while simultaneously lifting your heels from the floor and chanting “Om” mentally. Retain the breath after the inhalation and mentally chant “Om” again. As you exhale, chant “Om” out loud, simultaneously lowering your arms out to the sides and down, and your heels to the floor. Repeat six times. After the last repetition, rest in samasthiti for a round or two of breath. Purpose: To introduce larger standing movements and coordinate those movements with chanting and gesture. How To: Step your left foot forward, keeping feet hip-distance apart, back foot turned slightly out to the right. Inhale fully and exhale completely. As you inhale, lift your chest, raise your arms forward and overhead, while bending the front knee and arching the back. Open your palms as if reaching for the source of light, silently chanting “Om jyotir aham.” Retain the breath after the inhalation and silently chant “Om jyotir aham” again. On the exhalation, chant “Om jyotir aham” out loud as you lower your palms to the crown of your head, slide them down across your forehead and throat, and bring them to rest at the heart, as if drawing light down into your heart. Stay in position as you inhale and feel your heart fill with light; exhale, lower your arms, straighten your leg, and release the posture. Repeat a second time. Step your feet together and rest for a round or two of breath before switching sides. Do the same asana and chant again, but this time, bring your hands to rest at the navel instead of the heart, as if drawing light down into your belly. Inhale a second time as you feel your belly fill with light; exhale and release the posture. Repeat a second time and then rest for a round or two of breath before switching sides. Do the entire sequence four times on each side, and then step your feet together and rest for a round or two of breath. Inhale as you expand your chest and lift it away from the belly, stretching the front of your torso and flattening your back. Lift your chin slightly. Exhale as you draw the belly in, rounding the lower back, bend the elbows, and take the chest and belly to the thighs, hips to the heels, and forehead to the floor. Repeat six times. Purpose: To coordinate breath regulation, chanting, and visualization. 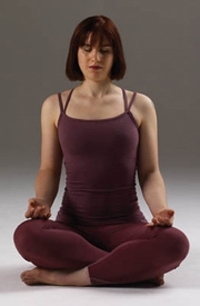 How To: Sit in sukhasana, elevating your sit bones with a folded blanket or a cushion, if necessary, or sit on a chair. Lengthen your spine and relax the body to enable your focus to remain on the breath. Allow your eyes to close or remain slightly open. Now bring your attention to the crown of your head. Inhale fully and exhale completely. Repeat each round for six breaths. After completing rounds one and two, breathe normally, resting for a cycle or two of breath. And then continue on to round three. As you inhale, chant “Om jyotir aham” mentally, while bringing your attention to the heart. Retain the breath after you inhale, mentally chanting “Om jyotir aham” again. Feel light expanding in your heart. As you exhale, chant “Om jyotir aham” mentally, and feel light emanating from your heart as your attention rises back to the crown. As you inhale, chant “Om jyotir aham” mentally, while shifting your attention from the crown to the navel. Retain the breath after you inhale, mentally chanting “Om jyotir aham” again. Feel light expanding in your belly. As you exhale, chant “Om jyotir aham” mentally, and feel light radiating up from your belly as your attention rises back to the crown. As you inhale, chant “Om jyotir aham” mentally, while shifting your attention from the crown to the root at the perineum. Retain the breath after you inhale, again chanting “Om jyotir aham” mentally. Feel light expanding at the root. As you exhale, chant “Om jyotir aham” mentally, and feel light radiating up from the root as your attention rises back to the crown. Following the third round of pranayama, release the breath, and come into inner stillness. With full present awareness, feel light radiating from within you and all around you from your root to your crown. Feel as if you are sitting in a radiant circle, and rest in that light. Depression goes beyond feeling sad, which is a normal and healthy part of coping with what life hands you, including disappointment and loss. Sadness becomes pathological when its level of intensity, duration, or frequency begins to significantly impact your self-image and your ability to perceive the world around you (what I call the thought sphere) or limits your role in life and the ability to function (the behavioral sphere). Although yoga can profoundly benefit those who suffer from depression, if your symptoms persist, despite your best efforts, you should seek out the help of a mental health professional. Gary Kraftsow has been a pioneer in the transmission of yoga for health, healing and personal transformation for over 40 years and is known as a leading expert in Yoga Therapy. He began his study of yoga and yoga therapy in India with T.K.V. Desikachar, in 1974 and received a Viniyoga Special Diploma from Viniyoga International in Paris, France in 1988.